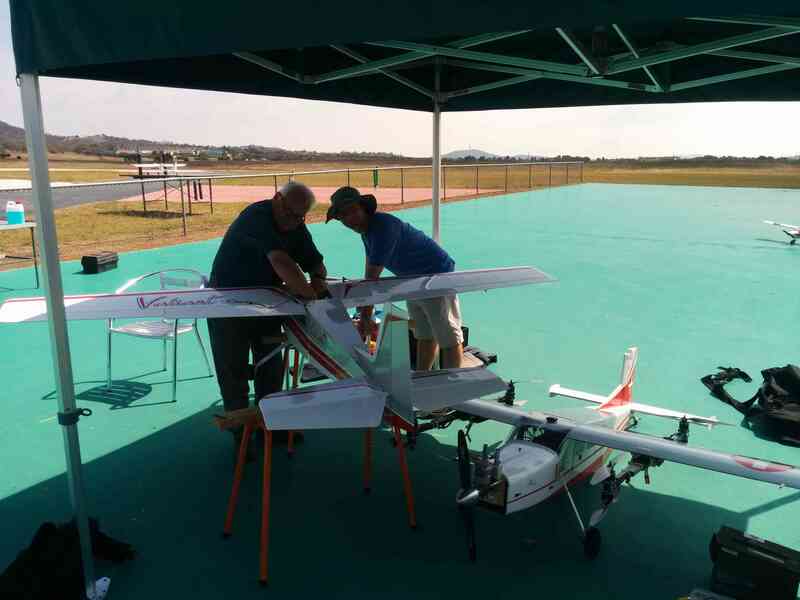 When we were first designing a large QuadPlane we did consider an octa design, but rejected it due to what we thought would be a high degree of complexity and unnecessary weight. Needing wiring for both 8 vertical lift motors plus 4 controls for fixed wing flight, and extra controls for ignition cut and auxiliary functions like remote engine start, choke and payload control we worked out we'd need 15 PWM outputs. The Pixhawk only has 14 outputs. After the failed ESC on the previous plane lost us the aircraft we looked again at an octa design and found that it would not only be possible, but could potentially be simpler for wiring than our last aircraft and be lighter as well, while having more lift. To start with we looked for motors with a better power to weight ratio than the NTM Prop Drive 50-60 motors we used on the last build. We found them in the t-motor 3520-11 400kV motors. These very well regarded motors have a considerably better power to weight ratio, and back-to-back mounting of them was extremely simple and light with the above clamping arrangement. that allowed us to have a single wire from a Y-lead on the SBUS output port of the Pixhawk going to each wing. We modified the BRD_SBUS_OUT parameter in ArduPilot to allow setting of the SBUS frame rate, with up to 300Hz SBUS output. 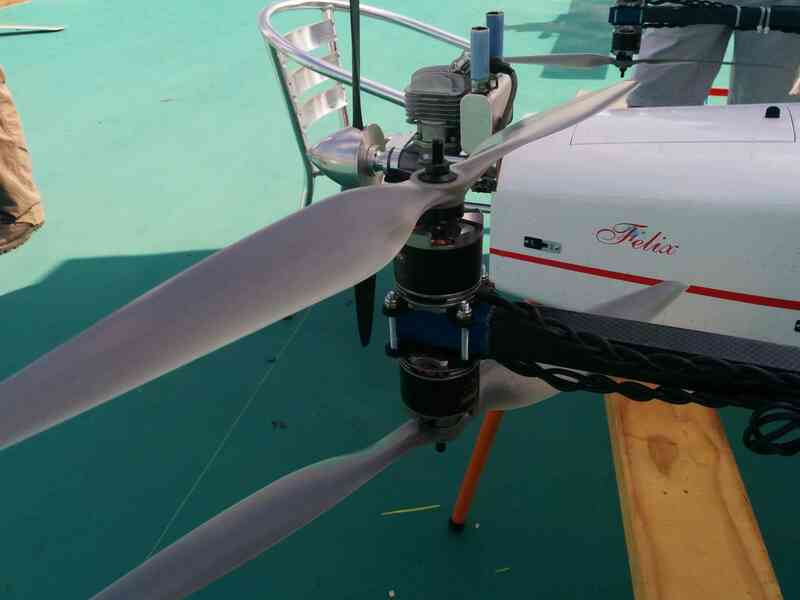 For a large QuadPlane 300Hz is plenty for multi-rotor control. 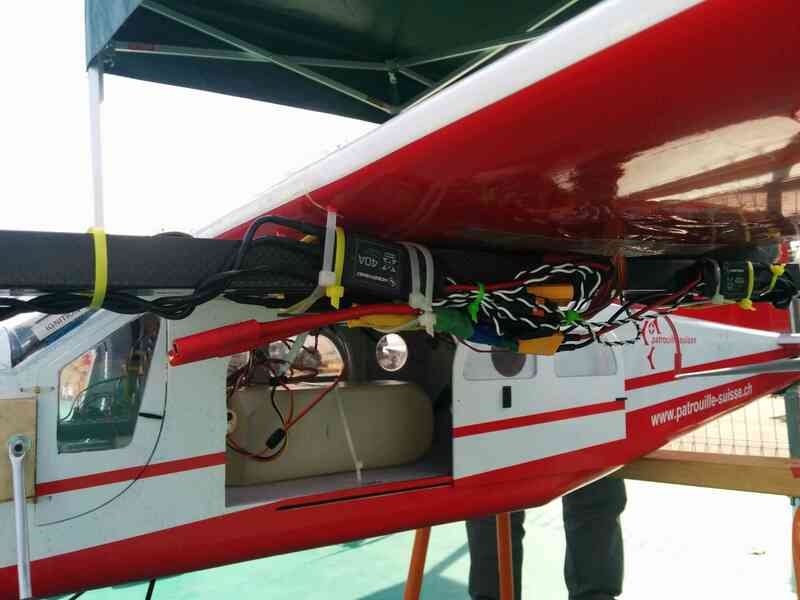 The arm mounting system we used was the same as for the previous plane, with two 20x20x800 CF square section tubes per wing, mounted on a 300x100x1 CF flat plate. The flat plate is glued to the wing with silicon sealant, and the CF tubes are glued to that plate with epoxy. For ESCs we used the HobbyWing 40A, which has a burst rating of 60A. That is well above our expected hover current of 15A per motor. Combined with the redundancy of the OctaQuad and the better reputation of HobbyWing ESCs we were confident we wouldn't have a repeat of our previous crash. For batteries we switched to 6S, using one 5Ah battery per wing. That gives us over 4 minutes of hover flying time while keeping the weight well below our last build (thanks largely to the lighter motors and ESCs). For this initial test flight we had the fuel tank mounted horizontally unlike the previous vertical arrangement. This was OK as we only filled it a small amount for these test flights. We will be converting to a vertical arrangement again for future fights to reduce the impact of fuel slosh causing CoG oscillations. We may also fill it with fuel anti-slosh foam as we have done on some other aircraft (particularly the helicopters). 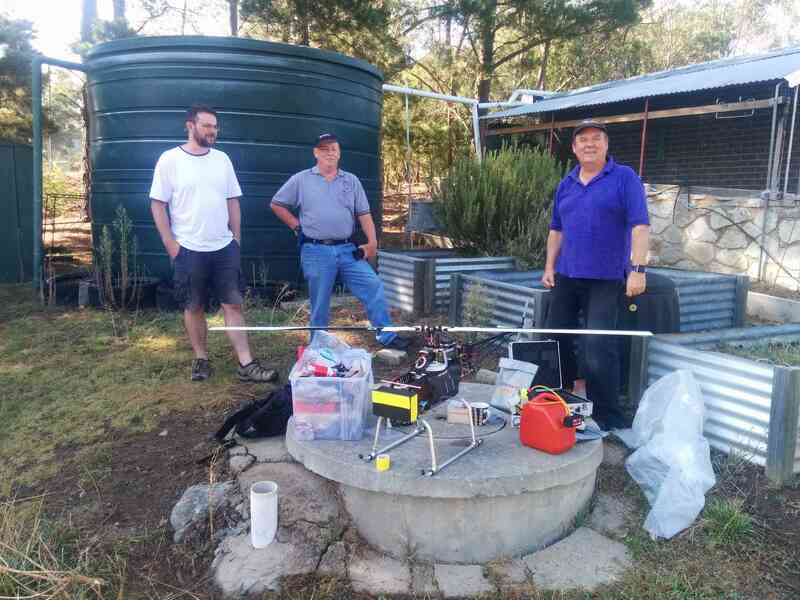 Overall the build came out about 1.5kg lighter than the previous build, coming in at 12.5kg dry weight. With a full load of fuel we'd expect to be about 13.5kg. We did three test flights yesterday. The first was just a quick hover test to confirm everything was working as expected. After that we did the first transition test under manual control, which worked very nicely. The copter part of the tuning could definitely do with some work, but we thought it was stable enough to do a full auto mission. It was a short mission, with just two full circuits before landing, but it nicely demonstrated autonomous VTOL takeoff, transition to fixed wing flight, transition back to hover and auto landing. The landing came in within a meter of the desired landing point. We had set the distance between the transition point and landing point a bit short, and we hadn't included a mission item for the plane to slow down before it transitioned which led to a more abrupt transition than is really good for the airframe. Going from 100km/hr to zero over a distance of 77 meters really puts a lot of stress on the wings. We'll fix that for future missions. It is nice to know it can handle it though. The transition to hover also caused it to climb a fair bit which meant it spent more time in VTOL landing than we would have liked, chewing through the battery. That was caused by it having to pitch up to slow down enough to achieve the stopping point in the mission which caused it to climb as it still had a lot of lift from the wings, combined with a high angle of attack. It didn't help that we had a slow slew rate on the petrol motor, reducing the motor from full throttle to zero over a 3 second period. We chose a slow slew rate to reduce the chance of the engine cutting due to fast throttle changes. We can fix that with a bit of engine tuning and a longer transition distance - probably 130 meters would work better for this aircraft. The climb on transition also took the aircraft into the sun from the pilots point of view, which isn't ideal but did result in a quite picturesque video of the plane silhouetted against the sun. The full flight log is available here if anyone wants to see it. The new features (new SBUS output support and OctaQuad support for quadplanes) will be in the 3.5.1 plane release. we are all set for lots of VTOL fun! Many thanks to everyone who helped with the build and as always to CMAC for providing a great flying field! Looks like it's working really well. Not only is it a VTOL but it's a hybrid! Nice. So was the brake set on ESC s? Comments of wind milling in flight. Can you measure drag with fixed prop vs wind milling? Nice work! Overall a much better looking flight. I note that the aircraft is still fairly draggy because of the octo setup and below your target speed at only 22m/s, despite most of the props auto rotating. It gets a bit tipsy on landing, did you manage to get her pointing into the wind better this time? Looks good though...bit of a beast! It looks much more responsive that the previous one, likely due to the smaller props used. The aerodynamic effects of the wing still seems quite a bit though. Did you have yet another windy day at CMAC? 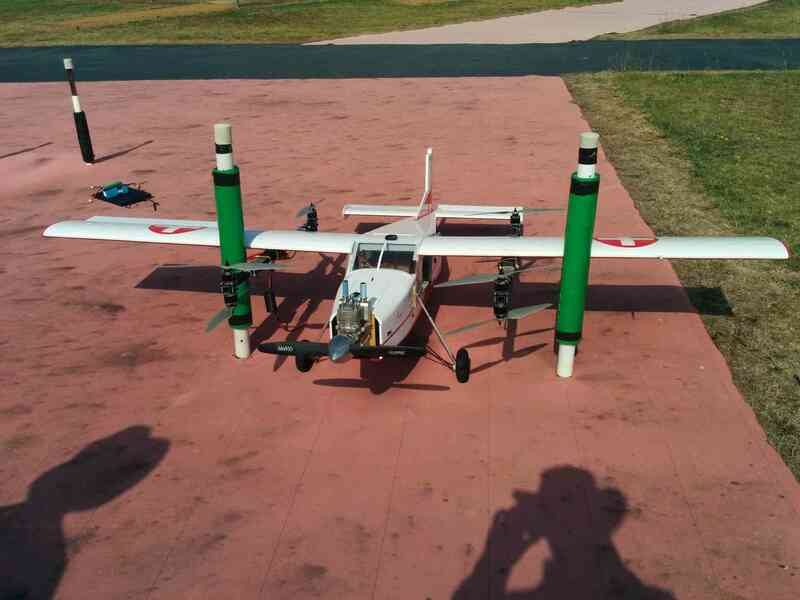 With the throttle control of the forward motor, is it possible to have that airspeed modulated ie so it reduces according to airspeed to the point the quad motors provide all the lift at just above wing stall? @JB, the comments in the video about speed and drag turn out to be incorrect. It looks like having sat in the garage for 1.5 yrs the airspeed pressure ratio has changed - possible the silicon tubing has changed property a bit? Once I corrected for that post-flight by matching to GPS speed over the circuits I found it was actually flying about the same speed as the quad setup (about 28m/s). Most of the props don't seem to spin in flight, and those that do spin slowly. We may add a servo based stopper rod to stop that spin, but it doesn't appear to be as big a problem as we thought it might be. The prop size is actually the same as the quad (18x5.5) so we actually have twice the prop disc area, although the effective area is reduced a bit by the coaxial setup. On the throttle control, it uses Q_ASSIST_SPEED as the speed below which it automatically starts assisting the plane. So you can in fact fly in FBWA mode and just slow down to a standstill and it will hover waiting for you to go again. We had that set to 19m/s for this flight, which is pretty conservative. I suspect the stall speed is more like 16m/s, but we haven't tested. In regards to the landing and wind direction, did your wind heading work better this time? It looks better. @JB, the auto mission was actually our 3rd flight, its just that we did all 3 flights in one day. First flight was just hover, 2nd was transition under manual control, 3rd was full auto. It was a long day at the field, with quite a bit of log analysis between each flight. 28m/s isn't all that fast for the base airframe - it easily does 35m/s without all the load on it, and normal RC pilots would put a heck of a lot higher g forces on it than the autopilot does (as we limited it to 45 degree bank angle). 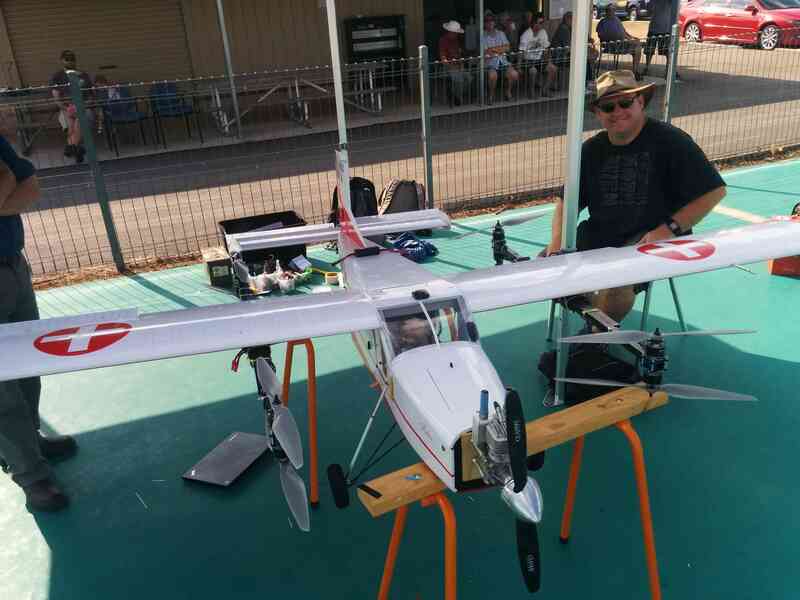 We were still nervous as we're flying it at nearly twice the design weight, but we did think it would handle it based on the small load factor from the (relatively) gentle flying. There wasn't a lot of wind for this flight, at least given the size of the airframe. The one we had trouble with was the Firstar build, but that was higher wind, and its an underpowered foamy with half the cruise speed, so much more wind affected. It will be interesting when we test the porter in 25 knots, which is what we need to handle to do the OBC. Can you explain again maybe with a drawing the SBUS usage ? Where did you purchase the cf rectangular arms?